Myth #1: Granola is too difficult to make at home, so I try to pick out the best at the grocery store. Granola is as easy as you want to make it! It’s versatile enough that you can gather ingredients you already have in your pantry. (ie. oats, seeds, dried fruit, coconut etc.). Then, add in a little sweetener (honey, maple syrup, blended medjool dates, brown sugar etc.) and watch it crisp up in the oven for an hour. We’re not harvesting our own oats here! Myth #2: All granola is healthy. While some grocery store granolas can be relatively healthy, by making your own at home, you can control exactly how much (if any) fat and sugar go into it. Make sure you read labels carefully, some granolas that are marketed as healthy are loaded with sugar! Look for ingredients like the sweeteners we’ve listed above. Minimize the chocolate, pretzels, or other unhealthy add-ins. You want to stick to the ingredients that will give you the most benefits. 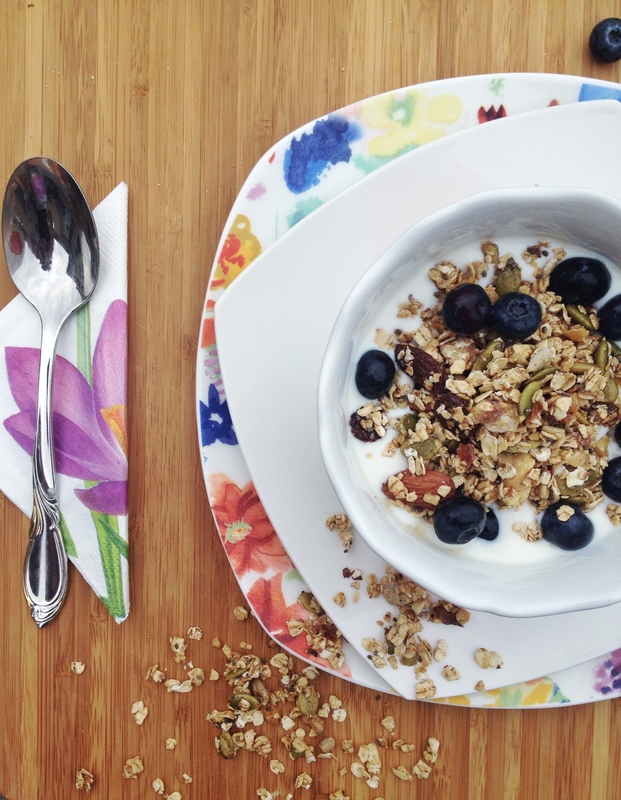 Myth #3: Granola is only good in yogurt parfaits. My favourite myth. I happen to be sensitive to dairy and have had to be a little inventive with my granola. While these days grocery stores are offering yogurt alternatives (hello coconut yogurt! ), apple sauce also makes a great base. You could also add in some almond butter and press into a pan to make your own granola bars (or the base for dessert bars – coconut cashew cream anyone? mmm). Read on for the recipe to the delicious maple walnut granola. No processed sugar to be found here! (Yet, just as delicious). Preheat the oven to 350F. Crush the walnuts over a cookie sheet. Add almonds. Roast for approximately 15 minutes, until the scent is really magnified. Make sure to shake the pan every few minutes to prevent the nuts from burning. While the walnuts and almonds are in the oven, mix together the remainder of the dry ingredients in a medium bowl. Set aside. Combine walnuts and almonds with the remainder of dry ingredients. Lower oven heat to 175F. Mix in maple syrup with dry granola. Spread in a thin layer on greased cookie sheet (coconut oil works well here). Roast for 45 minutes to 1 hour, until mixture is no longer sticky. Get inventive with how you use this tasty treat!